(Hawaii)– Braving the Nor’easter weather, Shidler College of Business undergraduate students traveled to Boston to compete in the 9th Annual CUIBE (Consortium for Undergraduate International Business Education) International Business Case Competition held at Northeastern University’s D’Amore-McKim School of Business in October. The Shidler team placed second in a field of 16 teams from leading undergraduate international business programs from across the nation. Team members Eryn Yuasa (’19), Dakota Kubacak (’18), Edwin Wong (’18) and Kelly Zheng (’20) took first place in their preliminary round against University of San Diego, Marist College and Temple University. The Shidler team placed second overall to first-place winner Olin School of Business, Washington University in St. Louis. The challenge was to provide recommendations to the vice president of social responsibility of Hilton Hotel Worldwide on the growing epidemic of human trafficking. 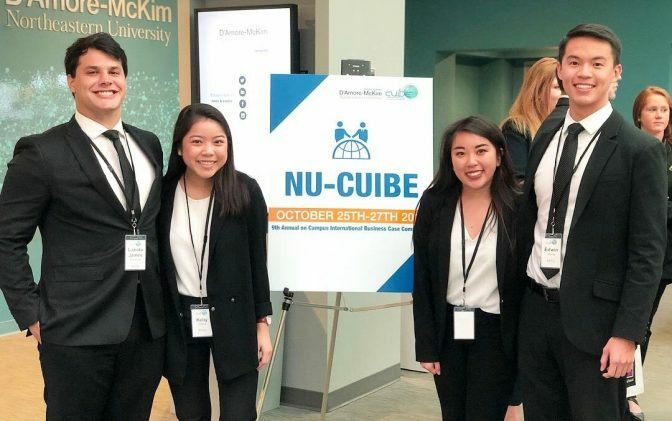 The CUIBE case competition gives students an opportunity to showcase their knowledge in international business through a competitive environment. Each team is given a case study to analyze within 24 hours before the competition begins. The winners of each bracket move on to the final round. The teams are judged on their analysis, recommendations and overall presentation. Read more on the Shilder College of Business website.